szcz's audio adventures: Psychodrumma, machine for blinking lights and making noise. Psychodrumma, machine for blinking lights and making noise. 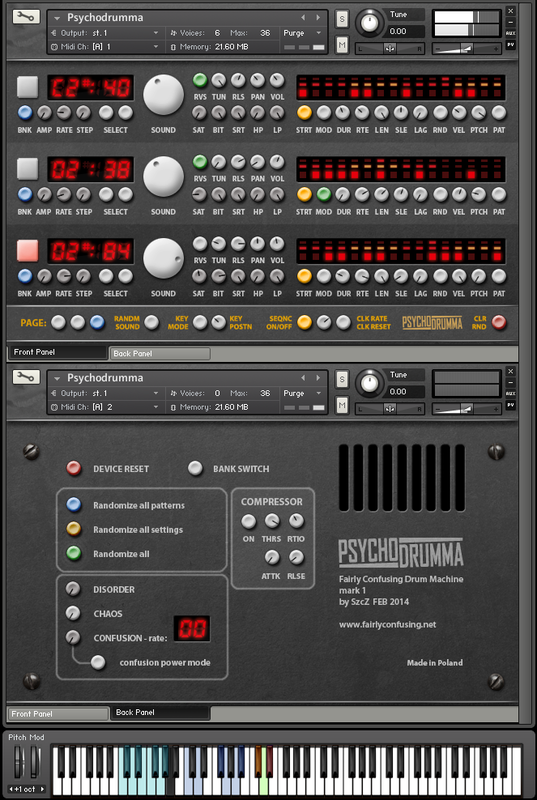 Psychodrumma is nonsensical drum machine for NI Kontakt 4, focused on creating random and randomly evolving rhythmic patterns. It is experimental sound device and although it could be used as a regular drum machine, it would be probably impractical. It is build of nine modules, called pads, each can playback a sound from one of two banks of 100 samples each, each has separate sound control rack and its own simple sequencer. All sequencers are synchronized with host tempo, but can run at different relative speeds and their start points can be de-synchronized, so to say. The fun feature of Psychodrumma is, that it can play by itself, all of pad's settings can be randomized on user input, gradually or periodically. You can just tune settings, let it play and observe evolving waves of randomness. This device comes with its own sample set. 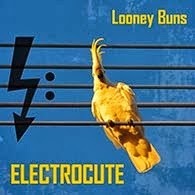 It is eclectic selection from variety of sounds I have recorded over the years: synthesized sounds, field recordings, animal sounds, unusual percussion, bass and guitar noises, voice fragments, household objects, radio noise, vinyl crackles, car engine, fireworks, icy snow squeaking under heavy boots or all the above mixed an layered in one sample. However, it can be used with any set of samples, you would just need to rename them and replace 'factory' files. Files are named by numbers, so it will be fairly easy, if you are familiar with any batch renaming software. There's no point in getting further into details here. If you like, see the PDF manual. Now, some sound examples. First a set of nine randomly generated patterns, they change every 4 bars across 100BPM 4/4 track, at the end the track tempo is automated to slow down. Second example is made with the same template, but 'factory' banks has been replaced by randomly selected group of acoustic drums samples, mainly from Kontakt's library, orchestral and world percussion. Note that these sounds are obviously not a part of the download, this is just an example of how the device can sound with alternative sample set. Finally, here's a video, showing how operating it looks like. First, I construct a simple rhythm, using factory preset sequence patterns and then wash it out with randomizer functions. Psychodrumma is free to download and use in your music. 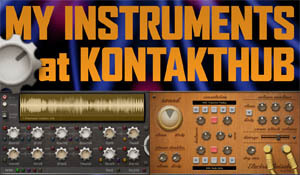 You will need full version of Kontakt 4 or newer to make it work. 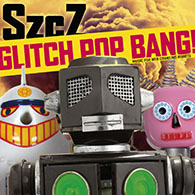 The download is 19MB, it contains 200 wav files, 24/44, manual in PDF and sampler program. Get it here. Have fun. Psychodrumma is followed by Psychodrumma mark II, read about it here. I've been thoroughly testing Psychodrumma (1, not 2) by SzcZ, "Fairly Confusing Waveforms". + category: drum machine/sequencer with 9 individual "instruments"
- Algorhythmic randomness of different kinds! fractal, generative, primes... gaussian... THIS is the core of the Psychodrumma concept and could be developed much further. - Or even better: cycles of different durations for each instrument! - Possibilty of using your own collection of samples but not renaming, but indicating "use this folder"
- Saving one pattern (or set of patterns) as preset, another pattern as second preset AND morphing (modulating) between both, stepwise. I see that, in part, some of these wishes are implemented in the Psychodrumma II version. In part. I hope my wish list is an additional inspiration for version III, which I promise to purchase (if at least the first 3 wishes are implemented!). Thanks for this. I've been tweaking this for the last 3 hours! Now, if I could just work it into one of my songs. :-) Thanks again.